Charles Spencer Chaplin began his illustrious American movie career in 1914 with the Keystone Film Company in Edendale, California. After making several films there, he left in 1914 to accept an offer with G.M. Anderson of the Essanay Film Manufacturing Company. He made his first three films at the Chicago Essanay studio but didn’t like it there. He moved to Essanay’s studio in Niles, California and stayed for almost three months. Here he made “A Night Out”, “The Champion”, “In The Park”, “A Jitney Elopement” and “The Tramp.” He then went to Los Angeles in April to finish out his Essanay contract. The following year, in 1916, Chaplin started his own company by building the Lone Star Studio at Lillian Way and Eleanor Ave in Hollywood. The small studio consisted of two open-air platform stages and an office building, which doubled for a prop storage and laboratory. As Chaplin's popularity increased, so did his need for larger quarters. 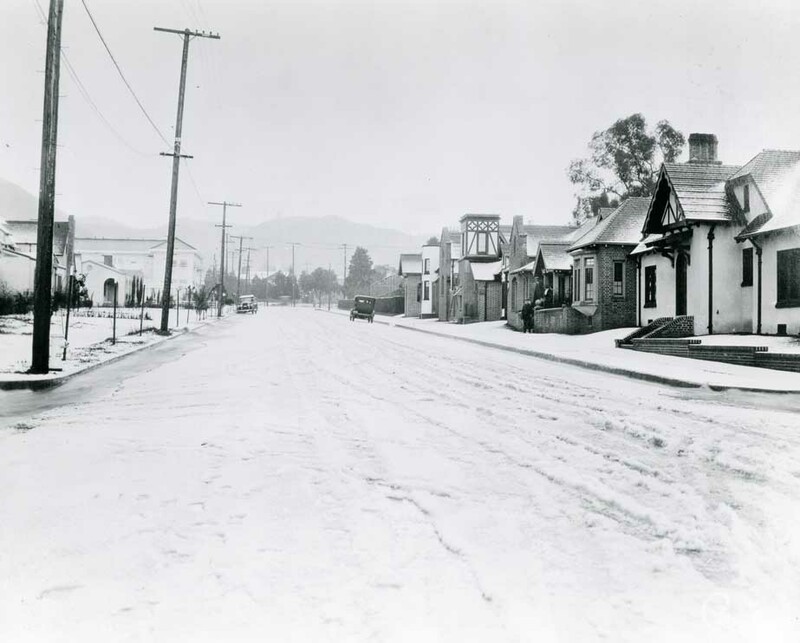 In November, 1917, he acquired a beautiful estate in Hollywood on La Brea Avenue, between Sunset Blvd. and DeLongpre Ave. The property contained a ten room colonial style residence surrounded by five acres of lemon, orange and peach trees. The land behind the house was developed into a new film factory, incorporated as the Chaplin Studios Inc. and capitalized at $200,000. It was finished in April, 1918, with Charles and his half-brother as general partners. The entire complex at 1416 N. La Brea Ave. consisted of two large stages, one open and one closed. The actual studio itself only comprised approximately one-half of the total grounds. 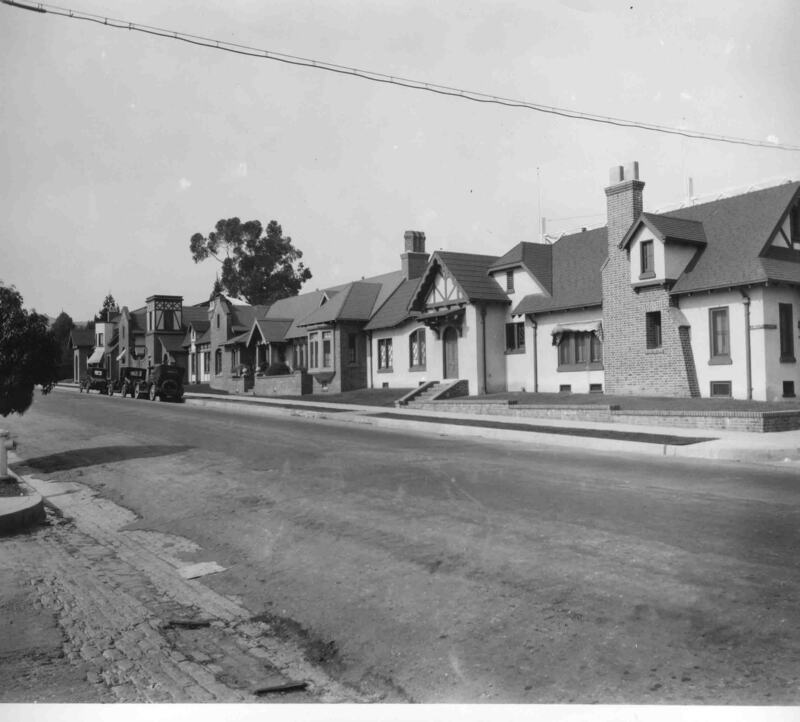 The northern portion of the land, near the corner of Sunset and La Brea, contained the residence where Chaplin’s mother and brother, Syd, lived, and a tennis court where Chaplin himself often played. Chaplin made seventeen films at his new facility, beginning with “A Dogs Life” in 1918. The year following the studio’s completion, United Artist Corporation came into existence when the screen’s most famous talents, Mary Pickford, Douglas Fairbanks, D.W. Griffith and Charles Chaplin banded together to distribute their independently made films. During the next few years, Chaplin made some of his most memorable pictures including “The Kid”, “The Gold Rush” and “The Circus.” In the late thirties, he began work on “The Great Dictator”, his first sound film. Released in 1940, it was a political statement of ridicule and contempt for the fascist leaders Hitler and Mussolini. Even though it was a box office smash, it arrived too late to influence world events. The year after Chaplin completed his last American film “Limelight” in 1952, he sold his beautiful studio to Webb and Knapp Corporation who converted the complex into a rental lot known as Kling Studios. Stanley Kramer leased space in 1953 and 1954 to make two classic films, “The Wild One”, starring Marlin Brando and Lee Marvin and “The Cain Mutiny”, starring Humphrey Bogart, Jose Ferrer and Van Johnson. . During the 1950s, Superman, Inc. took up quarters to make it “Adventures of Superman” for the growing medium of television. During the same period, the 2 1/2 acres comprising the northern section of the property were sold to Safeway Markets. 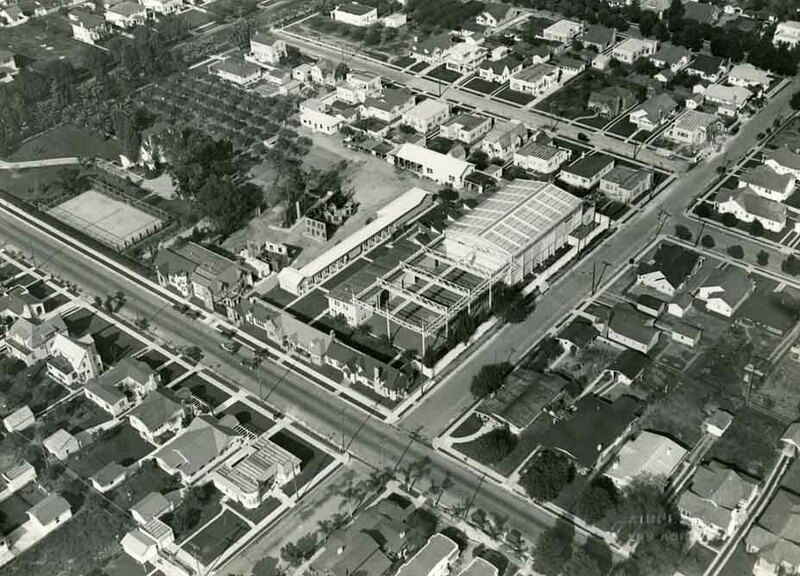 The old colonial house was demolished and a market built facing Sunset Blvd. The studio itself was purchased by Red Skelton in 1960 for $680,000. Skelton spent an additional $2 million dollars on improvements and used the studio to tape his Red Skelton television comedy series for CBS. His intention was to also produce other shows but, for a variety of reasons, his plan did not materialize and he sold the studio to CBS in 1962. CBS invested heavily in improving the facility, especially for their popular TV series, “Perry Mason”, which was made there for the next four years. In 1966, CBS sold the Studio to Herb Alpert and Jerry Moss for their A & M Record Company. A & M converted two sound stages and Chaplin’s swimming pool into recording studios. The 1985, the hit single and video, “We Are The World” was recorded at A & M by a large cast including Michael Jackson, Bob Dylan, Kenny Rogers, Stevie Wonder and Bruce Springsteen. Many other recording stars recorded albums and videos at the studio, including The Carpenters, The Police, Moody Blues and Van Morrison. The elderly Chaplin briefly visited his former studio in 1972 when he made his only return trip to America to accept an honorary Academy Award. In February 2000, Jim Henson’s children purchased the studio for $12.5 million to serve as the new home of the Jim Henson Company. Jim Henson, who passed away in 1990 was the leading source behind “Sesame Street” and “The Muppets”. The largest collection of Hollywood Photos and Hollywood Photographs is on the hollywoodphotographs.com website.